Wow such a fun night! The Brightside gallery group show is always a great time. Kate Enoka, the owner and curator of the gallery has a fabulous collection of artists and everyone brings new and inspiring work for the show. We look forward to coming back to Kauai every year to see our creative friends and talk story. Kate does such a fantastic job organizing, hanging, curating and making sure everyone has a good time. She is really the star of the show because without passionate people like her, all of us artists would just be home at our studio with no one to share our work. Thank you Kate! Camille Izumi’s abstract underwater figures are eye catching beauties. 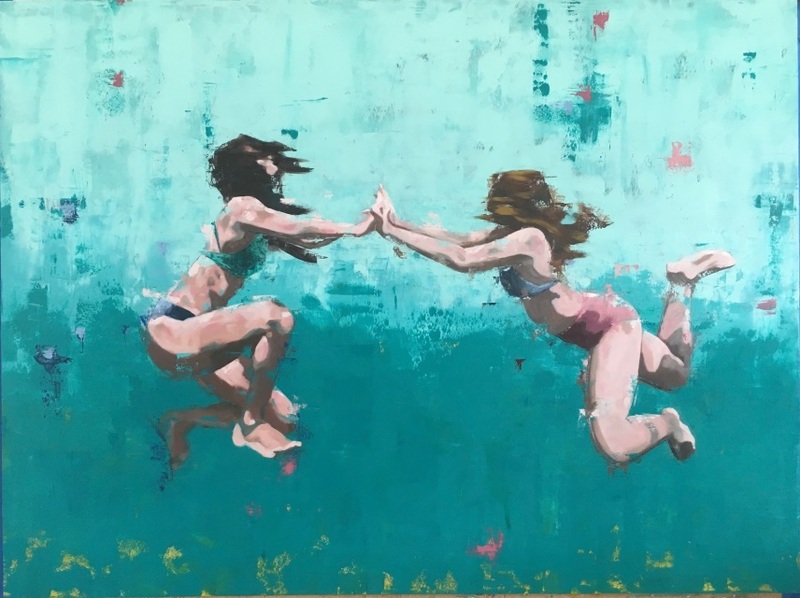 Strong pallet knife work with bright blues and aqua create water where floating characters appear weightless in unflattering positions viewed from below. Her works has a very contemporary feel but also timeless as well. I really enjoy her work and can’t wait to get one for our home someday. Here's Grant Peacoff putting a final varnish on his new piece. Grant Peacoff delivered a couple big beauties as always. His new landscapes of Kauai are just showstoppers. I’m loving his bold geometric brush strokes and his use of highlights to capture the radiance and mana of the Garden Isle. The large pieces just look amazing and showcase the power and beauty of the islands. Nathan layman’s wood wave carvings are being taken to a whole new level and it’s really cool seeing his work evolve. One of the new pieces he brought in was carved to encompass the grain of the wood to look like waves rolling in up the beach. His 3 dimensional pieces are getting deeper and more dramatic. I can’t help but look into the carved out barrel of the wave and stick my hand behind the lips of the breaking waves. I’m still a curious kid at heart. Tim Saunders metal work is so cool. I love all his work but there was one little fish that had a big nut for its eye that had so much personality. It was like the fish was staring out and watching me all night I just loved it. And of course Heather Brown and the Captin, you can’t have an art show in Hawaii without the “Godmother of Surf Art”. Chris and Heather are such an amazing team. Although they couldn't make it to the show their work stood in their place and brought happy vibes to the Hanapepe Gallery. The Brightside gallery has such a good vibes and all the artists involved show so well together. I feel so fortunate to be able to show work here alongside these wonderful creators. The group show has become an annual event and we are looking to next year already. Till next time!